Educating our clients to enhance their moving experience. In conjunction with the in-home or telephonic survey of your household goods, your Certified Moving Consultant has already begun a discussion with you about Valuation Options. As there is quite a bit of confusion regarding the term valuation and insurance, we thought it would be helpful to explain why we use the term valuation and what it means to you. The moving industry is regulated by the states and the federal government. 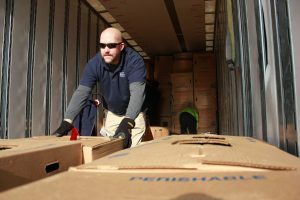 Both the State of Connecticut and the Federal Government require that moving companies provide their customers with a minimum amount of compensation (Valuation) for the goods of their customers being moved or stored. The problem we have found is that many movers mistakenly interchange the terms Valuation and Insurance. While the two concepts are similar, there are quite serious differences. Proper Valuation protects the Mover and the Customer but it is not “insurance” in the legal sense. Valuation establishes a level of compensation for the goods being moved or stored should they be lost or damaged. Increased Valuation reflects an increase in the level of compensation provided for an additional fee. Insurance, on the other hand transfers the compensation provided by the mover to the insurance company directly using an insurance contract, in exchange for a specific premium. The cost for an insurance option is typically higher because of the coverage provided and the paper processing necessary to put it into effect. Option 1: Full Replacement Value. This is the most comprehensive option available to protect your belongings. By choosing Full Replacement Value, Woodland Moving and Warehouse will, at our option, either repair, replace, or offer cash settlement for any item that is damaged, destroyed or lost. If an item is repaired, it will be restored to the same or similar condition and appearance as it was prior to shipment. Woodland Moving and Warehouse may also opt to replace an item with one of like kind and quality, or pay you for the cost of the repair or replacement. There are additional premium costs and deductible choices for Full Replacement Value coverage, and you must declare an amount equal to at least $6.00/lb times the weight of your shipment. It is important to note that customers waiving Full Replacement Value in writing prior to the move commencing cannot later elect to purchase Full Replacement Value during the process of the move or after it is completed.